There are changes in store for the geography of Ventura County. With every day, current emissions trends continue, a new map of the county is being drawn, and the science is there to prove it. A 2015 paper published by the Proceedings of the National Academy of Sciences entitled “Carbon choices determine US cities committed to futures below sea level” makes clear that long-term sea level rise could be as high as 9 meters. A rise of this magnitude would be devastating to Ventura County, but even the less dramatic near-term effects will be painful. Benjamin Strauss, a scientist who serves as vice president for Sea Level and Climate Impacts at Climate Central, made it clear that human-driven climate change was a fact. Estimates vary as to how high the seas will actually rise by 2100. According to the Intergovernmental Panel on Climate Change Fifth Assessment Report, the sea could rise about 1 meter by the end of the century. The 2014 National Climate Assessment estimated a rise of 1 to 4 feet (a meter is 3.28 feet). Strauss was able to shed some light on future sea-level rise. Lily Verdone, coastal project director for The Nature Conservancy, California chapter, pointed out the danger that sea-level rise poses to some areas of Ventura County. She indicated that The Nature Conservancy’s models show that increased flooding will become a problem. “In some cases like the Oxnard plain, where there are a lot of beaches, and Naval Base Ventura County, that’s a big low-lying plain naturally. That area will probably be most impacted by sea-level rise,” she said. Strauss stated that sewer systems and rainfall accumulation could also affect whether or not these areas flood. We can also use Climate Central’s maps to examine the effects on Ventura County a rise in keeping with the higher estimates would have. In the event of a 2-meter rise most of Point Mugu, including the majority of the runaway, would be under water. Hollywood by the Sea and Channel Islands between Harbor and Victoria would suffer a large amount of flooding, as would Ventura Keys, Seaside Wilderness Park and the fairgrounds. Several other areas would enter the “below but isolated” category. It’s possible that the effects of climate change are already being felt. Susanne Moser, an expert in adaptation to climate change based in Santa Cruz, believes that coastal communities are already starting to see changes. “I’ve done a focus group study in Monterey, and people who have lived on the shore for 20, 30, 50 years have seen the shoreline change, and they know it,” said Moser. Moser indicated that her research showed that people who live in these communities are already starting to notice increased flooding. Strauss explained what this flooding has to do with climate change. A document summarizing the Surging Seas map on Climate Central’s website offered the following evaluation. “Based on the National Research Council’s mid-range Pacific coast sea-level rise projections, we project 2.9 feet of rise locally by 2100, from a 2012 baseline. Our analysis translates this to 0 percent cumulative risk of at least one flood exceeding 3 feet by 2030, a 63 percent risk by mid-century, and a 100 percent risk by 2100. Under the Council’s high-end projections, these chances increase to 3 [percent], 100[percent], and 100 percent, respectively, and we compute a 100 percent risk of at least one flood exceeding 6 feet by the end of the century,” it said. While the near-term impacts are of concern, the long-term impacts could be much worse. We are forging an agreement with the ocean. At some point the sea will come to get what’s owed. Indeed, a large part of Ventura County has already been condemned to return to the sea after 2100. Climate Central has another tool called Mapping Choices. This allows the user to see the level of flooding that would eventually be guaranteed if a certain degree of warming occurs by a certain year. The previously mentioned paper published by the Proceedings of the National Academy of Sciences is the basis for the tool. “Mapping Choices relates to really long-term sea level that will lock in in the near term from carbon emissions,” said Strauss. The National Climate Assessment says that with drastic cuts in emissions, warming could be held to 2.5 degrees Fahrenheit (1.3 degrees Celsius) by 2100. If current emissions continue it would lead to warming of more than 8 degrees Fahrenheit (4.4 degrees Celsius). 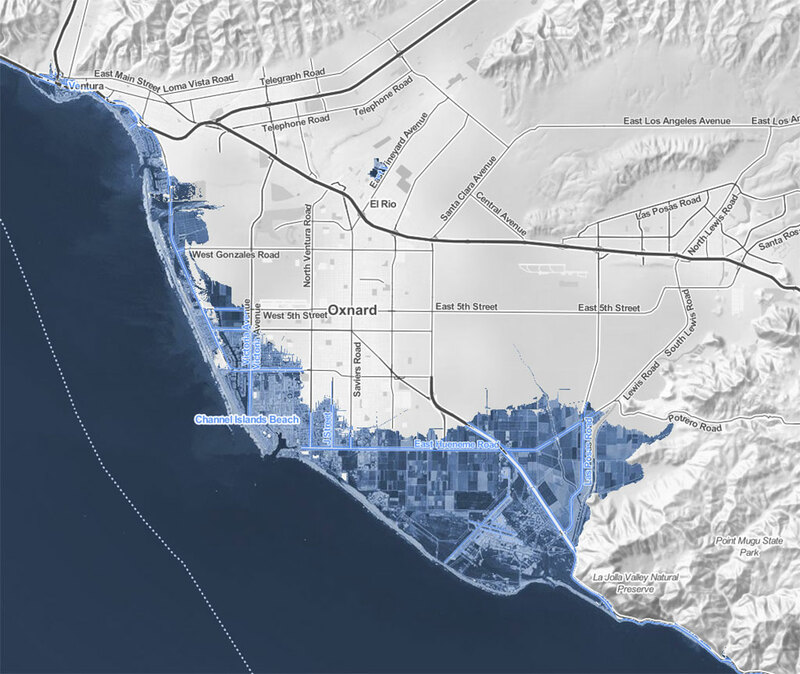 Mapping Choices shows that a rise of 2 degrees Celsius would submerge Point Mugu, most of Port Hueneme, Pierpont, Ventura Keys, most of Oxnard Shores, Surfers Point, the fairgrounds, stretches of the Pacific Coast Highway and other areas of the Ventura and Oxnard coast. A rise of 4 degrees Celsius would be even more devastating. Climate Central claims that this could take anywhere from 200 to 2,000 years to come to fruition. The map has a “When will this happen” button in the corner that explains its predictions. “It is easier to estimate how much ice will eventually melt from a certain amount of warming than how quickly it will melt, which involves more unknowns. The same simple contrast would apply to an ice sculpture in a warm room,” the map says. “Some research has suggested that the West Antarctic Ice Sheet has begun an unstoppable collapse, but the evidence is far from conclusive. The maps here do not assume inevitable West Antarctic collapse. If collapse has in fact begun, all locked-in sea levels would be higher than shown. Carbon emissions levels would still influence all outcomes,” it says. According to the United States Energy Information Agency, in 2013 California, the most populous state in the union, was the second-biggest energy-related carbon emitter behind Texas. California did come in 48th place, however, in terms of per capita energy-related carbon emissions. Of those emissions, by far the most came from petroleum products related to transportation. Natural gas in the electrical power, industrial and residential sectors was also a large emitter. Moser listed some ways that people can affect their carbon output. “In your daily life, transportation, how you use energy in your home for heating, cooling, all the gadgets we have,” she said. She also pointed out the importance of diet on climate change. In addition to eating foods that come from far-off places, Moser pointed out the effect that a meat-heavy diet can have. She was clear that the politicians we elect are of major importance. “The most important thing that all Californians can do is to vote the right people into Congress,” she said. The COP21 conference in December led to 195 nations agreeing to measures that aim to limit warming to less than 2 degrees Celsius. Moser was skeptical that the agreement could actually meet its goals, but stressed that it was important nonetheless. She also emphasized that some of the worst effects could still be mitigated.